Facebook Card is the new buzz; So are you in? It could be soon seen in your wallet, yes, in your wallet. Introduced on 31st January, 2013, Facebook Card is gonna be the next super-hit idea from FB. And the Social Graph Search, introduced in January 2013, has already stirred the scene of the search in the worldwide web arena. Whatever comes to your mind, just search it out and get some great results in and within Facebook. In case you haven't used the social graph search, just visit https://www.facebook.com/about/graphsearch and click on that try graph search button. Well, you would experience a whole new look with all the notifications, messages and friend requests on right just by the side of the settings. 1. 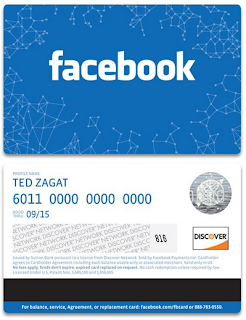 FB card initially looks great with its appearance and the business appeal. And goes handy offline. 2. With this card one can gift his friends an experience in places like Olive Garden (http://en.wikipedia.org/wiki/Olive_Garden), Sephora (http://en.wikipedia.org/wiki/Sephora), Jamba Juice (http://en.wikipedia.org/wiki/Jamba_Juice) and Target. 3. Instant notification on the Facebook account of the Card holder upon receiving a gift (adding to his card balance). 4. This card is reusable. It doesn't lose its charm just in one go, one can use and reuse. 5. Users can carry it in their wallets and redeem at the outlets. 7. Facebook presence in each and everything that you buy, rent and take on lease in a near future. 1. Too much of stress on being into transactions involving FB user profiles might hamper the system it's about to introduce. 2. Facebook first needs to cope up with the fake accounts (by large numbers) already running to make this FB card easier an experience. 3. The flow and overlapping of offers, services and the terms & conditions in using this card in certain stores and outlets. 4. The accountability of gift tax, wealth tax, sales tax and other taxes concerned in US and in around the rest of the world. So, what do you feel about this Facebook Card? Will you ever use it? If yes/no, then why?